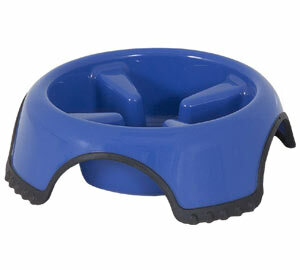 The Skid Stop slow feed dog bowl by Aspen Pet is a slow down bowl that will revolutionize the way your dog eats. 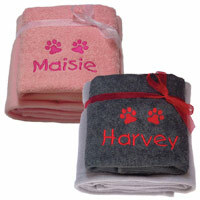 It is for fast eaters, to slow down the speed at which the dog eats and stop them gulping down their dog food. This bowl was borne out of the observation of dogs gobbling up their food and eating way too fast. This 'vacuuming' of food may result in a myriad of problems including overeating, vomiting, indigestion, bloat and coprophagia. Many dogs have an unhealthy habit of eating their food too fast. They love to lap up all the food in a swift, sweeping motion and gobble down or "inhale" their food like a vacuum cleaner. This way, they end up swallowing everything including air, without much chewing. The raised design in the centre of this slow feed bowl has 4 ridges which serve as an obstruction to deter your dog from making a clean sweep of their food. The same obstruction also makes it more difficult for dogs to get their muzzles near enough to the base of the bowl, and thus preventing them from "inhaling" their food. Slower eating makes your dog feel full faster, thus reducing instances of re-eating. As a result this bowl can also be a useful weight management tool. Dogs who eat too fast may also regurgitate as a result. By slowing down the dog's eating speed to a healthy and moderate pace, this problem can also be helped. 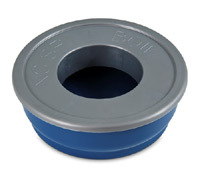 Made from dishwasher-safe heavy-duty plastic with a rubber base to help keep the bowl in place. One colour: blue plastic with black non-slip base. Supervise your dog's use of the bowl until you are confident it can be used safely without supervision. This bowl is designed to encourage slow, healthy eating habits but it is your responsibility to ensure the correct use of this product. If your dog needs encouragement, try adding some of their favourite treats to the food to encourage them to eat from the new slow feed dog bowl. If on the other hand they are too enthusiastic, to begin with let them eat most of their meal from their standard bowl and give them the last little bit of the meal in the new slow feed bowl, until they are used to eating from it. This way they are less likely to be hungry and get frustrated when it is first introduced to them.